Something new for hikers in New England. The recently completed Cohos Trail blazes north from New Hampshire’s White mountains to the Canadian border. This 162-mile Appalachian-like trail was the dream of Kim Nilsen who conceived the idea 34 years ago. I can’t wait to hike this trail. If you are looking for a new trail that promises pristine beauty, and want to be with only a few friends and not run in to scout packs and groups of hikers, I can’t think of a better place to plan a hike. When I’m in the mountains, I often wonder what it must have been like when Native Americans roamed the lands. What did they see? 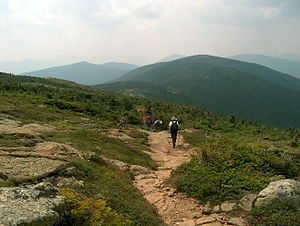 I bet the Cohos Trail in northern New Hampshire will get you very close to the untouched beauty of Indian times. This entry was tagged Appalachian Mountain Club, backpacking, camping, Cohos Trail, hiking, long-distance hiking, New Hampshire, Presidential Range, thru-hiking, White Mountains. Bookmark the permalink. The Cohos Trail appears to be quite an adventure. I noticed the flowers in the picture – I’d be taking photos or drawing the vegetation along the way to determine what each was. We miss so much by simply hopping in our cars. You are so right, Virginia. I plan to pack a small book on flora and fauna of the region. Stay warm. Looks like a beautiful hike! Thanks for sharing. You’re welcome. I wish I were out there now. Happy trails!